Place 1/3 of the corn flakes in an even layer in the bottom of an 8x8-inch serving dish. 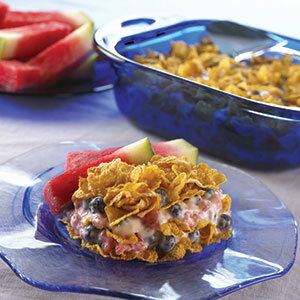 Mix together the watermelon, blueberries, and yogurt and spoon half of it over the corn flake layer evenly. Sprinkle another layer of the corn flakes over the yogurt and then layer the remaining yogurt over that. Sprinkle the remaining corn flakes evenly over the top.